Paris Tourism is famous widely because of its ability to capture the art and turn it into a fleeting experience for the tourists. The city is an urban metropolis with people bustling around however, it is beloved because of the panoramic views, the cultural places and the undisputed thrills which is why it is called as ‘The City of Light’ internationally. There are many attractions in Paris, however, when you mention the city, the first thing that comes in mind is the Eiffel Tower which offers a sweeping view of the city just like a lightening stroll in Paris. For most of the people, visiting Paris is nothing less than a once in a lifetime thing. Therefore, it is important to take care of all the minute things on the trip and that includes choosing where to stay among the Paris Hotels. If you come across people who have visited Paris, most of them would say that Paris is the first city that they have officially fallen in love with and they would regale you with the memories they have of their trip. While everyone expects different things to do in Paris; I think most of the people like loitering around in the neighbourhoods where you can experience the amusing architecture, the marvelling balconies made of wrought-iron and the shopping in Paris where you can buy baguettes as well. Paris is actually divided into 20 arrondissements and all of them are numbered in a spiral way with Ile de la Cite, as the centre. Ile de la Cite is an island that has the neighbourhoods of 1-12th close to it and the 12th-20th, along with the outer edge. So, based on what you’re expecting from your trip, you can choose to stay among any of the neighbourhoods where you will find plenty of Paris Hotels and elevate your travel experience. A hotel that takes you into the history and is just a stone throw from the notorious Seine. The title has been earned over the period after being changed because of its purity and simplicity. Location: 13 Rue des Beaux Arts, 75006 Paris, France. Distance from Airport: 31.5 KM from Charles De Gaulle Airport. Attractions: Oscar Wilde Room, A Vintage Decor, Hammam and a Pool. Approx cost: INR 20,000 per night. This hotel has been magnificent among the Paris Hotels and is known among the elite audience for the grandeur that it offers. Initially titled as l’hôtel d’Allemagne, it became l’hôtel d’Alsace and then it got changed to l’Hôtel in the 1960’s. However, it is built during the time of Rue des Beaux-Arts and as a result, this is located in the spot where the legendary Queen Margot has lived once. Renovated and decorated by Jacques Garcia back in 1967, years after. The hotel is proud both of the history and even the famous guests who resided in the hotel over the years. This hotel flaunts the multi-layered history of the Peninsula as it pulls off the contemporary French architecture in a neoclassical style. Location: 19 Avenue Kléber, 75116 Paris, France. Distance from Airport: 27.8 KM from Charles De Gaulle Airport. Attractions: Wi-Fi, Rooftop, Swimming Pool, Spa, Smoking Room, Alarm, Radio and a universal remote to control the temperature. Approx cost: INR 71,000 per night. The latest addition to the exotic Paris Hotels, this place has become successful in a lesser time. After an intense renovation that got carried for four years, The Peninsula has opened the doors in the year 2014 claiming to be the most beautiful hotel in entire Europe and after visiting the hotel, you might not want to stand against this statement. This hotel is owned by the Hongkong and Shanghai Hotels, a Chinese company which has redefined every element to make it stand out as the most luxurious hotel. If you’re looking for one of the best hotels to stay, this one is for you. As the name says, the refined and the modern decor; makes the place stunning and beguiling in the list of Paris Hotels. Distance from Airport: 27.9 KM from Charles De Gaulle Airport. Attractions: Breakfast Buffet, Cinema Room, WiFi, Free Films, Clarins Spa and Swimming Pool. Approx cost: INR 58,000 per night. Art is omnipresent in this hotel in the form an art gallery which compromises the central piece of the lobby. Located in the 8th neighbourhood, it is only a few steps away from the Champs Elysees and indeed one of the most beautiful Paris Hotels you can find. It is even awarded as the best luxury hotel back in 2013 and it has all the features that a five-star hotel has even when it is not. Phillippe Starck is the one who has designed the interiors to enhance the value that it holds. The Architect, Moussie has set the 18 room hotel in Strasbourg Saint-Denis, which is opposite to the Petite Saint-Martin theatre which is on the road. Astonishingly calm, this neighbourhood is known for the owl reputation it has. Location: 90 Rue René Boulanger, 75010 Paris, France. Distance from Airport: 23.3 KM from Charles De Gaulle Airport. Attractions: WiFi, Bar, Breakfast, Restaurant where you can even make your own cocktail. Approx cost: INR 14,000 per night. The Hotel Providence has a passing trend because of the phenomenon it holds. 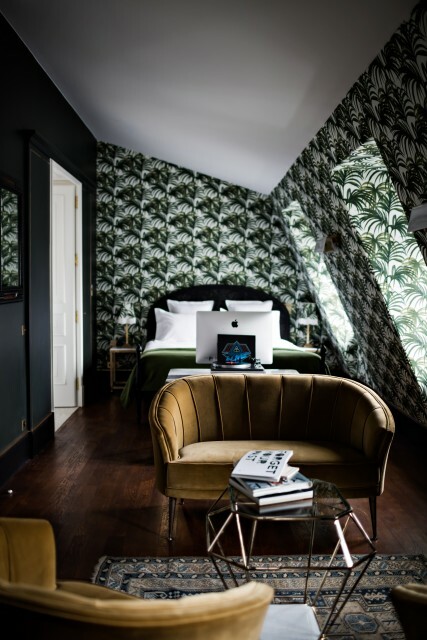 For many years, it has stood out to be one of the trendy and independent hotels that rejected all the strongholds of Parisian Luxe that covers the first, the 8th and the 16th neighbourhoods across the eastern Paris border. Among all the luxurious Paris Hotels, the Providence from Pierre Moussie is famous and exotic. 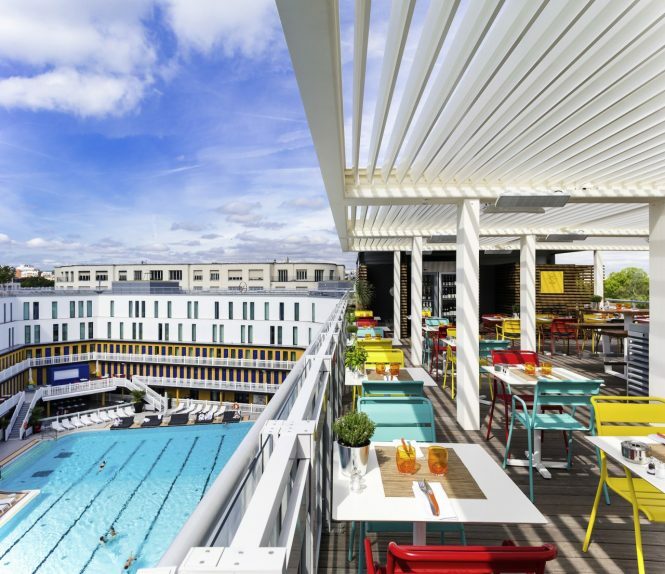 This hotel in the list of Paris Hotels is a place to drink the views of the most beautiful monuments right from the Eiffel Tower to the Sacre-Coeur. Location: 4 Rue de Valois, 75001 Paris, France. Distance from Airport: 31.3 KM from Charles De Gaulle Airport. Attractions: Spa, Fitness Room, Bar, Restaurant. Approx cost: INR 32,000 per night. 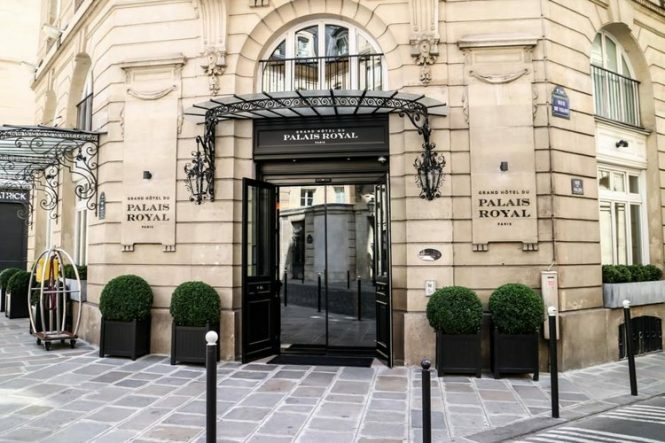 The Grand Hôtel du Palais Royal is quite similar to other hotels in the list of Paris Hotels. It appears more like the street in which it is, sharing a harmony. This place is down to earth, but sophisticated with the discreet layout. If you look from the Conseil d’Etat; it barely draws any kind of attention from the outside. 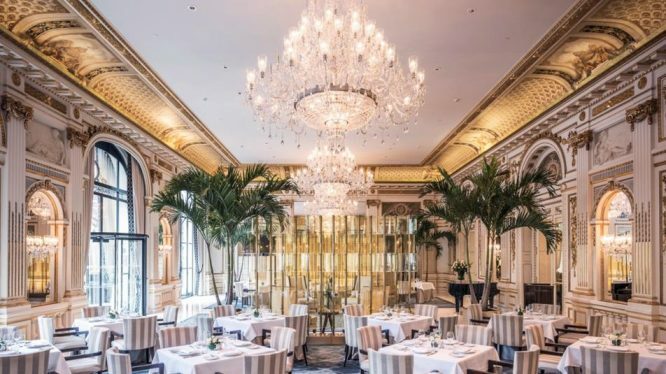 Once you’re inside, the princess staircases, the classic facades and the high ceilings decorated by Pierre Rochon will make you feel authentic and at the same time, royal. 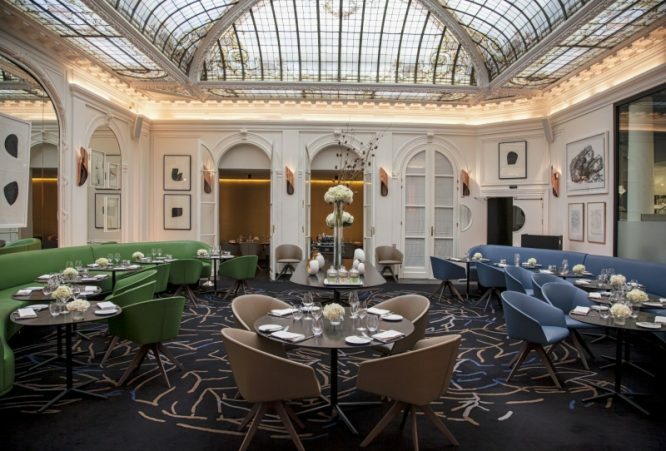 A high-end hotel in the Golden Triangle of Paris, it is a bastion of luxury, wealth and as well as fashion so that one can stand out in the crowd. Location: 49 Rue Pierre Charron, 75008 Paris, France. Distance from Airport: 28.2 KM from Charles De Gaulle Airport. Attractions: A Courtyard, A 30-meter Vertical Garden, WiFi, Bar, and Restaurant. Approx cost: INR 28,000 per night. The prestigious Pershing Hall is a primary example of the Paris Hotels which are located between the Champs-Elysees and the Avenue Goerge V, this building is steeped in the history. The 26 rooms of the Pershing Hall focuses on the beauty and the comfort with huge mirrors, king size beds, bathrooms and a place which is complete with a mounted bath, located on the white marble balls. The biggest attraction is the indoor patio, designed by the Patrick Blanc, a botanist. This Paris Hotel is modelled after the Cleo de Merode; a photo icon belonging to the 10th century. He has been a muse and the dancer for many years who led a pretty mysterious life. Distance from Airport: 29.5 KM from Charles De Gaulle Airport. Attractions: Fitness Room, Spa, Pool and a Garden for hire. Approx cost: INR 26,400 per night. 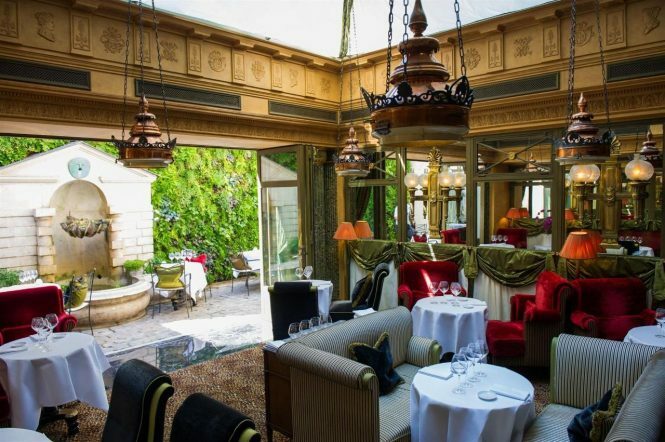 If you’re looking for places to admire in the Paris Hotels; Le Narcisse Blanc is the best places to visit in Paris. If you are going through the Sacre Coeur, Tour Montparnasse; you should definitely stay at the Le Narcisse Blanc. Located between the Les Invalides and the Eiffel Tower; it is majestically located with a spa that provides the views through the windows away from the hustle and the bustle. Le Narcisse Blanc is modelled after the Cléo de Mérode as mentioned and therefore, reminds you of his heritage. Calm, composed and luxurious; this credo among the Paris Hotels is physically close to the hassle, but once you enter; it is a world away. Location: 25 Rue Vernet, 75008 Paris, France. Distance from Airport: 27.7 KM from Charles De Gaulle Airport. Attractions: The glass dome which has been exclusively designed by Gustave Eiffel. Approx cost: INR 96,000 per night. Hidden tightly between the Place de l’Etoile and the Hotel Vernet; this place is known for the elegance and the splendour that has been persisting for hundred years. The elevator and the entrance are carved out of glass and wood, surrounded by stunning windows. The corridors are bright with graphic furniture and light carpets making it a tasteful luxury. The apartments are zen, filled with glass mosaics and marble basins along with the brass fittings bringing the nobility to you. People might have cold feet, but the Molitor as a Paris Hotel is an undeniably hot place. Even viewed from a distance, the yellow facade of this place manages to catch the eye. Location: 13 Rue Nungesser et Coli, 75016 Paris, France. Distance from Airport: 31.0 KM from Charles De Gaulle Airport. Attractions: Outdoor Pool, Rooftop and Spa. Approx cost: INR 17,000 per night. The opening of this Paris Hotel is grand and has made a splash because of the Art Deco pool, which has been redecorated. Being defunct for almost two decades after 1989, the pool has been subjected to colossal architecture near the 16th neighbourhood. If you’re someone who would want to spend hours and hours in the pool, this hotel is a perfect fit for you. Reincarnated as a luxurious five-star hotel with a spa and a restaurant, it is listed as a property in the heritage site and therefore, is a must visit. Known for the Duke’s bar and the 1930 cocktail menu; this Paris Hotel is known to deliver a delightful experience as the place oozes class with the mahogany panelling and the green leather seats. Location: 13 Rue de la Paix, 75002 Paris, France. Distance from Airport: 24.2 KM from Charles De Gaulle Airport. Attractions: A fitness room with the view of Paris Skyline; it even has a Michelin star restaurant. Approx cost: INR 64,000 per night. 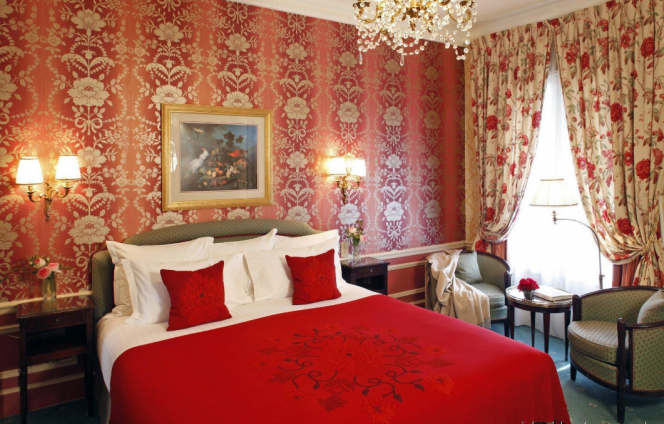 The famous Hotel Westminster on the Rue de la Paix shines with the British elegance. The buildings in the Hotel Westminister were initially a private townhouse but later turned into a hotel in 1905. In the year, 2015 it even got a makeover and today, it has 101 rooms; out of which 21 are suites and 80 rooms. Venerated by Pierre Rochon again, the famous designer who kept the spirit of the past architecture with console tables, vintage clocks, crystal chandeliers and marble fireplaces. Check out our Paris tour packages to explore the place that oozes love and romance like no other. Paris offers many sumptuous hotels that contain decent rooms with grand architecture and mind-blowing interiors. 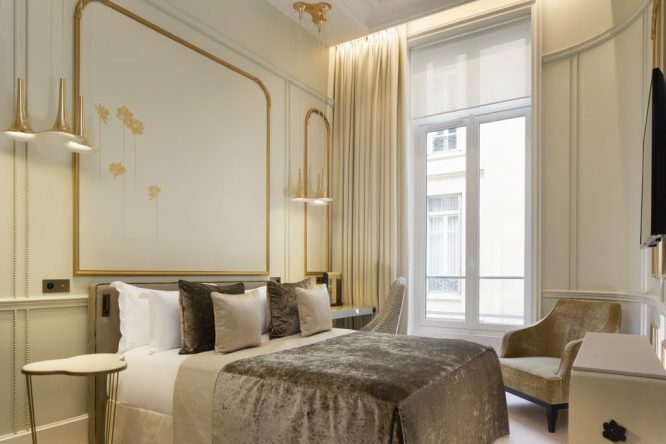 All these Paris Hotels can provide a wide range of spaces and one can make a decision about where to rest and where to keep your feet with all of them offering the hospitality and comfortable, luxurious and cosy rooms as well with the prices ranging from reasonable to rich. This list of favourite Paris hotels; should be considered for your stay for a grand trip. 1. What is the weather in Paris is like? Paris is enjoyable during the spring and the summer months as you bask in the Persian sun. The rain here is prevalent and the weather keeps hanging so it is recommended to carry an umbrella. Dressing in many layers is indeed advisable. 2. Where do I purchase the Paris Metro tickets? Tickets can be available using the automated machines which are located in all of the stations. Even the foreign credit cards accepted in the majority of the stations but make sure you carry change for quicker transport.